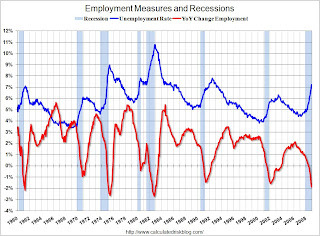 Nonfarm payroll employment declined sharply in December, and the unemployment rate rose from 6.8 to 7.2 percent… Payroll employment fell by 524,000 over the month and by 1.9 million over the last 4 months of 2008. In December, job losses were large and widespread across most major industry sectors. Nonfarm payrolls decreased by 524,00 in December, and November payrolls were revised down to a loss of 584,000 jobs. The economy has lost over 1.5 million jobs over the last 3 months alone! In December, the number of persons who worked part time for economic reasons (some-times referred to as involuntary part-time workers) continued to increase, reaching 8.0 million. The number of such workers rose by 3.4 million over the past 12 months. This category includes persons who would like to work full time but were working part time because their hours had been cut back or because they were unable to find full-time jobs. 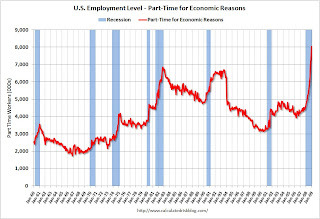 Not only has the unemployment rate risen sharply to 7.2%, but the number of workers only able to find part time jobs (or have had their hours cut for economic reasons) is now over 8 million. Of course the U.S. population is significantly larger today (about 305 million) than in the early ’80s (about 228 million) when the number of part time workers almost reached 7 million, but the rapid increase in part time workers is pretty stunning. Others: Menzie Chinn pgl, spencer, cbpp, Justin Fox, RTE, RTE2, Felix Salmon.